What better time to talk about beach vacations then now,when we’re battling the snow and ice of a January in London. Last month I went off to Thailand to escape the snow but looks like I came back a bit too early. 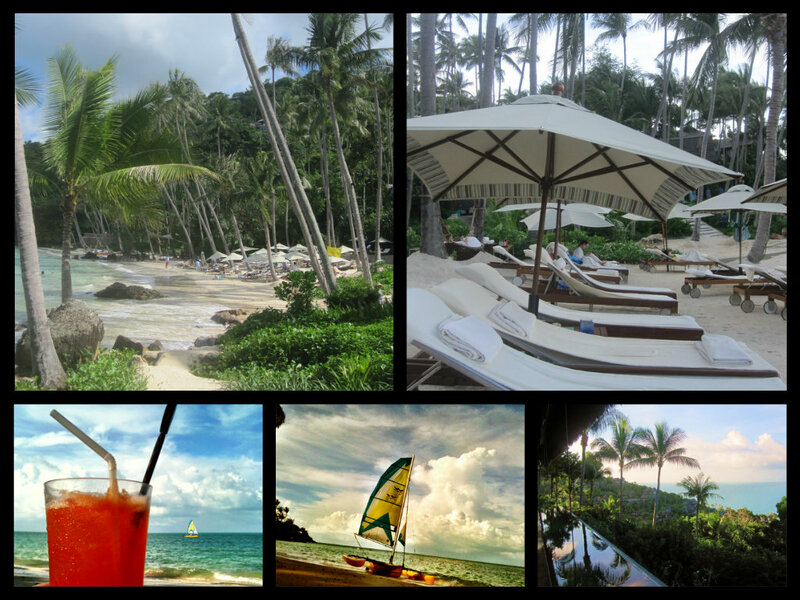 I do, however, have some great memories from my trip, one of the highlights being a stay at The Four Seasons Koh Samui. Although the island may be known as a party place, the Four Seasons there is tucked away on a private hillside which is only accessible by a long and winding path up a hill. Once you reach the top of the hill and after a quick check in, a golf cart is summoned to take you to your very own villa. While you’re a guest of the Four Seasons all transport around the hills is by deluxe golf carts. You just call reception and they send a golf cart to chauffeur you to the beach, the restaurant or the spa. 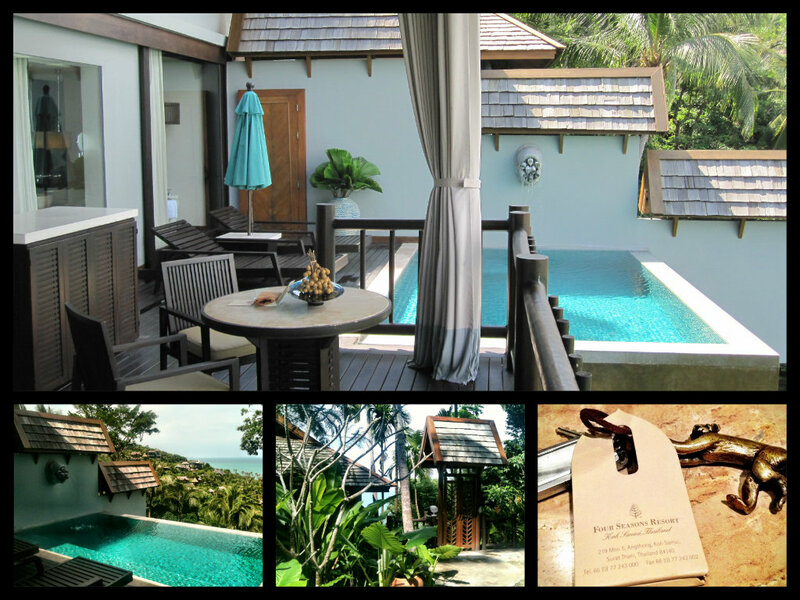 The Four Seasons Koh Samui only has private villas which are scattered on the hillside, each with their own private infinity pool and views of the Gulf. The back of the villa doesn’t have proper walls, only glass walls and sliding glass doors. There are also private residence rentals which are great for families. The villas are big, a good portion taken up by a veranda with a double lounging bed, dining table and of course, a deck which is part of the infinity pool. The cool sound of running water, courtesy of the pool fountain made for a very relaxing stay. The bedroom was huge with big comfy beds and mosquito nets. Those buggers were buzzing about but the mozzie nets worked really well. As did the air conditioning, although at night it cooled down with balmy breezes blowing across the veranda. While we were there, we were treated to a spa treatment in the hotel spa. It’s set in a coconut grove with 5 salas which are covered verandas with two Thai style massage rooms, indoor and outdoor showers and outdoor bathtubs, all made of the cool dark wood that is used for most of the construction there. We both opted for a salt scrub and massage. The treatment started with a foot washing with Thai herbs and then commenced once we were on the massage tables with the chime of a ceremonial bronze bowl. This was no Thai massage, I didn’t feel like I had been beaten up afterwards (although I’m sure they offer those Thai style massages as well),but rather it was very relaxing. I almost fell asleep while we were waiting for our golf cart home. 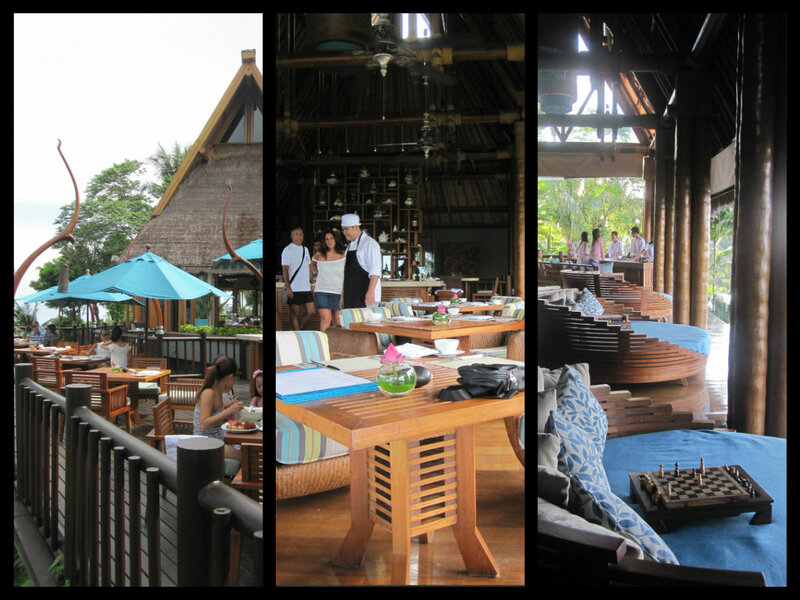 The resort has 2 restaurants, Pla Pla on the beach and the Lan Tania which is perched on a hilltop overlooking the Gulf. 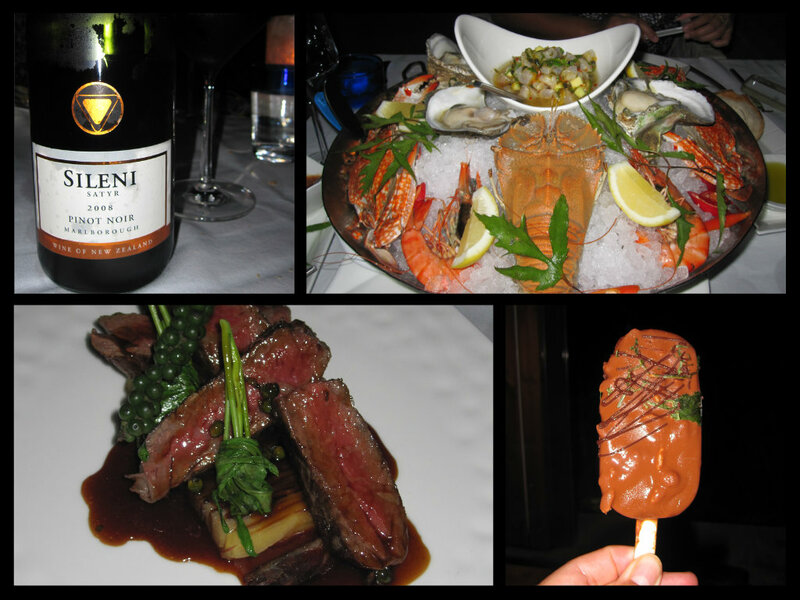 Pla Pla’s cuisine focuses on Western cuisine whereas Lan Tania features Thai and Italian. The first night I had the signature dish at Pla Pla, the Wagyu ribeye, with potato and pancetta terrine, morning glory and a green peppercorn sauce. I paired that with a New Zealand pinot noir, the Sileni Satry 2008 from Marlborough. As it was still quite warm in the evening, the wine was thankfully chilled and we were given an ice bucket to keep it at a proper temperature. The winelist of the resort was well thought out, there was a good mix of both European and New World wines, prices were not that cheap but considering the exorbitant taxes on wine (600%), I thought they weren’t outrageous. We started off with seafood so fresh it needed to be slapped before being eaten! I finished off with the most amazing dessert, raspberry sorbet dipped in chocolate. The contrast between the fruity sorbet and the chocolate was fantastic! I wish I could get that somewhere around here. The next day, we lazed around the private beach drinking mai tais all afternoon and had dinner at Lan Tania later that evening. 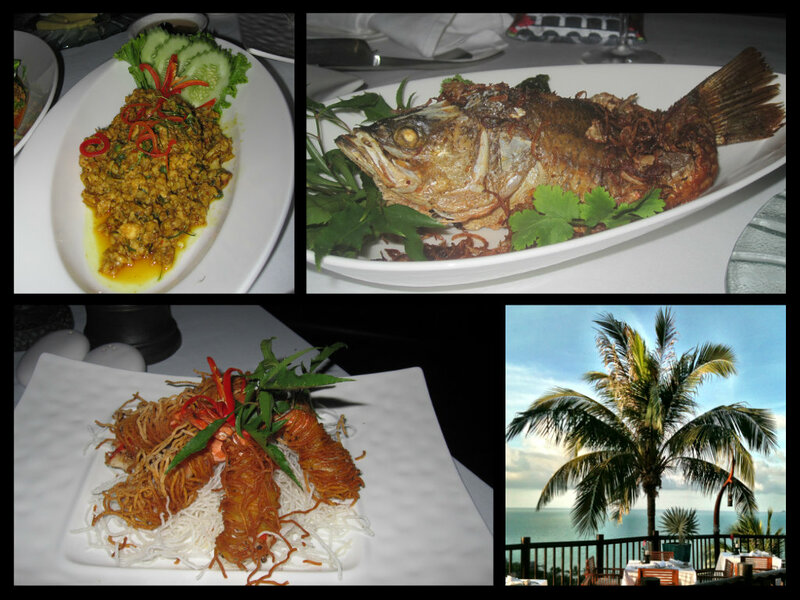 My friend Nikki, who accompanied me to Koh Samui is Thai, so she ordered off the menu which was fine by me. The chef was also quite pleased and even came out to say hello. We had a deep fried fish along with a spicy shrimp paste. I asked Nikki how authentic it was and she said that the food was excellent. We also had a larb chicken (very spicy) and vermicelli wrapped shrimp. The food was spicy but only because we asked for it that way and will or will not spice your food they way you want it. That night we went for beer but there were some German rieslings on the list which would go well with Thai cuisine. The next morning on the open veranda overlooking the Gulf, we enjoyed our last breakfast at the Four Seasons of fresh tropical fruit and traditional Thai eggs. The breakfast buffet is a bonanza of food, with French pastries, fresh fruit, an omelette station, traditional Western breakfasts and, of course, Thai food. 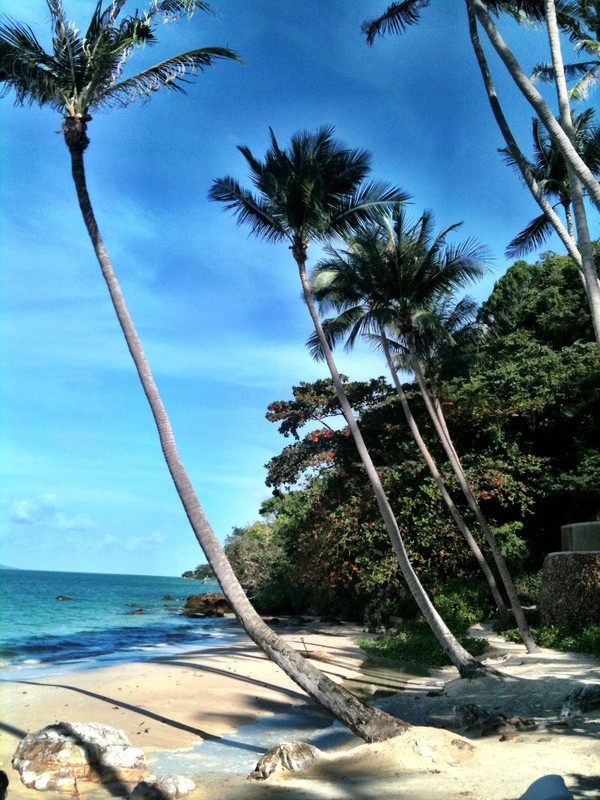 The Four Seasons Koh Samui is an absolute gem and if you’re planning on a trip to Thailand soon, I’d highly recommend staying there, you won’t regret this tropical beach paradise. 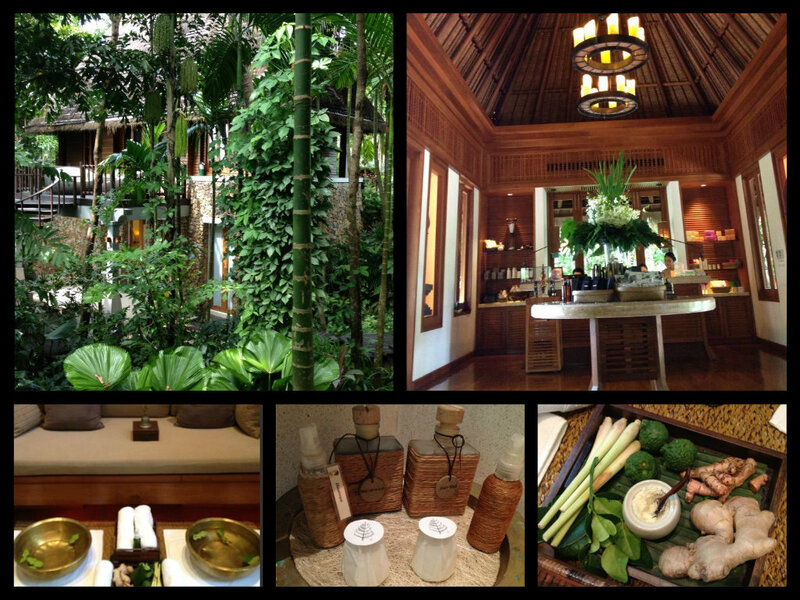 I’d like to thank The Four Seasons Koh Samui for inviting me to visit them while I was in Thailand. I wouldn’t mind publishing a post or elaborating on some of the subjects you write with regards to here. Again, awesome web site! I’ll be sure to bookmark it and return to read more of your useful information. Thanks for the post. I’ll certainly comeback. 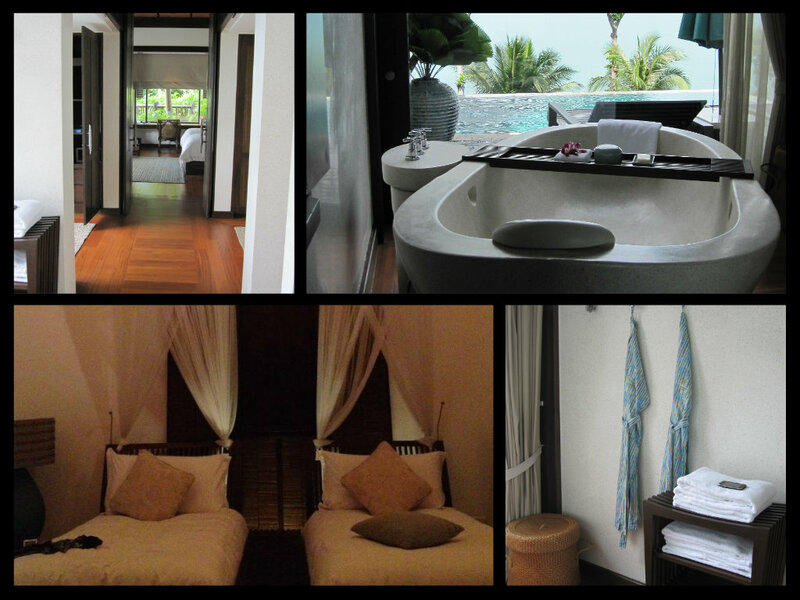 I checked the Koh samui villa website a few day ago. They are providing marvelous accommodation in the residents. Somebody in London must be able to replicate that choc dipped raspberry sorbet, it was sooooo goood!